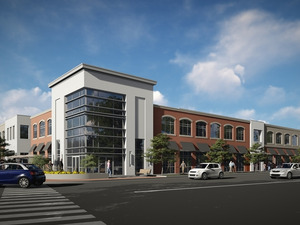 United Community Bank has broken ground for their new multi-use development at the major intersection of East Main & South Pine in downtown Spartanburg. The development, which will be anchored by a United Community Bank branch, will be named United Community Plaza. The property sits at the corner of East Main Street and South Pine Street on the east side of downtown and is made up of eight original properties. United Community Bank will occupy the corner position and have more than 7,000 square feet between two floors. The facility will have two remote drive thru teller lines as well as an ATM. The office will also have a community room, which will be available for community organizations to use, and multiple casual seating areas throughout the office. There will be ample parking on-site. United Community Bank partnered with Guy Harris of Spencer/Hines Properties and Willow Flats Development to envision the project. Equip Studio designed the facility and Harper Corporation will serve as general contractor for the project. Demtek, Inc. completed demolition of the multiple existing structures that were on the site. Additional development for retail, dining and office is planned for the site, with more details to be named at a later date. The total development will be approximately 16,500 square feet. “I have seen the potential for this prolific corner of downtown for several years. As a longtime partner of United Community Bank, I’m thrilled that they will be the ones to occupy this phenomenal location. I’m grateful for their partnership in making this project a reality,” said Guy Harris.